Bernie Sanders, an independent senator from Vermont, has announced that he’s challenging Hillary Clinton to be the Democratic Party’s nominee for president. So it’s time to return to the Candidate Evaluations series, where we examine a candidate’s background, policy history, and explicit statements in an attempt to figure out whether the candidate would actually be any good at being president. Too often, no one bothers to ask these questions, focusing instead on electability or likability. Previously, I’ve covered Ted Cruz, Rand Paul, Hillary Clinton, and Marco Rubio. None of them looked especially promising. Can Sanders do better? Like many of the other candidates, Bernie Sanders has an undergraduate political science degree (in his case, from the University of Chicago, the place where I did my MA). Unlike many of the other candidates, Sanders never pursued a law degree. He worked a variety of odd jobs after college, spending time as a carpenter, writer, and researcher, among other things. He got involved in the anti-Vietnam protest movement in 1971. He was mayor of Burlington, Vermont for eight years during the 80’s, defeating both democrats and republicans, including one candidate who had the support of both parties. In 1990 he became the first independent to be elected to congress in 40 years, jumped to the senate in 2006, and won reelection in 2012 with 71% of the vote. He has consistently supported economic stimulus spending, including many of the less popular smaller stimulus packages that did not become law. He has consistently supported union rights. He supports a constitutional amendment barring corporations from making political donations and permitting congress to enact further campaign finance reform. He voted against the Iraq War and consistently voted to remove troops from Iraq during the 2000’s. He sponsored the Global Warming Pollution Reduction Act of 2007, which would have created a national cap and trade system with the goal of reducing carbon emissions 83% by 2050. He wants to go beyond Obamacare and create a single payer health care system like the ones in Canada, the UK, and elsewhere. He spent 8 and a half hours trying to stop the 2010 Tax Relief Act because he opposed cutting taxes on the rich. He opposed the Toxic Asset Relief Program (TARP)–this is the program that bailed out the financial system–on the grounds that it distributed the costs of the bailout in a regressive way. He claimed he would support a bailout if it had been consistent with his four principles, which aimed at raising taxes on the rich, raising wages for the lower and middle classes, reimposing the regulations that were removed during the Clinton administration, and break up firms that are “too big to fail” into smaller, more manageable units. He supports gay marriage, but more importantly, he supported it long before it became popular to do so–he’s on record supporting gay marriage consistently since the 90’s–he even voted against the Defense of Marriage Act in 1996. He supported a constitutional amendment protecting gender equality and tried to reintroduce the Equal Rights Amendment. He tried to eliminate the death penalty during the 90’s and has consistently supported legislation making it harder to impose. He has consistently supported abortion rights, including late term abortions. He opposes school vouchers and frequently votes to increase public education spending. He voted against welfare reform in 1996. He voted against financial deregulation in 1999, which played a crucial roll in permitting “too big to fail” firms to arise. I’m pretty impressed. Bernie Sanders is on the right side of most of the big issues in politics today–inequality, austerity, global warming, and so on. When I wrote Hillary Clinton’s candidate evaluation, there were a number of different policies and issues I found concerning–DOMA, financial deregulation, welfare reform, the Iraq War, etc. On every one of those issues, Bernie Sanders disagreed with the Clintons and took the correct side. This places Sanders in the same territory as many of the old model social democracies in Europe during the 1960’s and 1970’s. In contemporary politics, he’s nearest to the greens–indeed, his brother, Larry Sanders (no, not that Larry Sanders), is running for parliament in the UK on a Green Party ticket. Why isn’t Bernie Sanders running as a green? The Green Party has had little success in presidential politics–it is most famous for sabotaging Al Gore in 2000. My guess is that Sanders doesn’t want to play any role in getting a republican elected, so he will contest the democratic nomination but decline to run against the democratic nominee in the general if he doesn’t get it. But this is only a guess–if Sanders doesn’t get the nomination, he could run as a green or as an independent (like Ross Perot did in the 90’s), potentially creating a significant headache for someone else. Strategically, Sanders’ best hope is to unite the 40% or so of democrats who remain anti-Clinton and then attempt to pry further democrats loose from there. This will be very hard–in April 2007, Clinton had 35% to Barack Obama’s 17%. 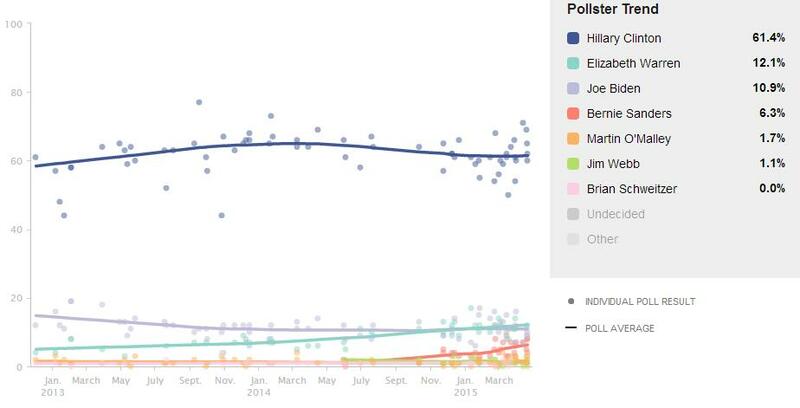 Today, Clinton has 61% to Sanders’ 6%. But no democrat has gained more support than Sanders over the last few months, and a little press coverage can elevate any candidate from obscurity to contention in short spans of time. He may be a long shot to win, but Sanders is a good candidate and would do fine as president. We should not allow the questions about his electability to become a self-fulfilling prophecy, particularly given that the man has so many reasonable policy stances. If I were able to vote, Bernie Sanders would have mine. Bernie is a better candidate than Hillary Clinton by a country mile. Her universal name recognition next to his is the main killer. If more ordinary people knew who Bernie Sanders was and what his positions were, he’d had way more support than Hillary. The way it is now, moderate Democrats refuse to vote for him (even though they admit they like his policies better than Clinton’s) simply because they know his chances of beating Hillary are incredibly slim. A guiding tenet of New Deal Democrats is that the Federal Gov’t should shield individuals from big business. Yes, this is authoritarian and perhaps paternalistic, but the ideology derives—with inherent contradiction—from Jeffersonian thought (i.e., states rights, individualism, and Libertarianism). How did your methodology pan out Sanders’ leaning Libertarian? I agree with it, but I fear I may be misunderstanding the chart. The left/right axis is indicative of the amount of control the state ought to exercise over the economy, while the up/down axis is indicative of the amount of control the state ought to exercise in non-economic social areas. A candidate who is near the top is more likely to support state surveillance, indefinite detainment, restrictions on civil liberties, bans on abortion or gay marriage, drug prohibitions, etc. Sanders is more socially libertarian then the rest of the candidates on a few different issues–he was against the Patriot Act, he wants to pardon Snowden, he’s been a longtime supporter of LGBT rights, and he wants to decriminalize marijuana and end mandatory minimum sentences. On many of these issues he’s significantly more radically left libertarian than Clinton (who supports the Patriot Act and wants to incarcerate Snowden). These stances are not directly connected to economic issues, so they don’t influence his left/right position, only his up/down position. So for instance, the Soviet Union was left authoritarian–it exercised economic control, but it also did not protect civil liberties, operating on the principle that the state was entitled to intervene in every area of life, both economic and social. 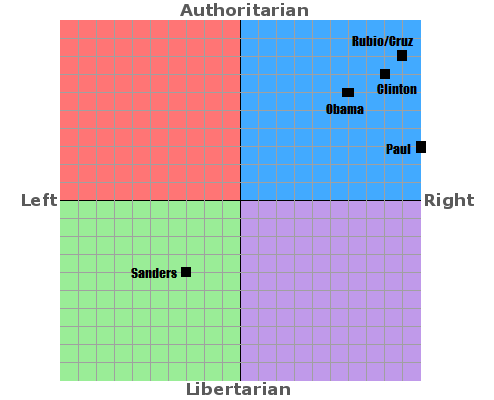 Sanders is moderately left wing (he wants more state influence over the economy), but he is not authoritarian, he does not support significant limits on social freedom and would relax many current interventions that the state makes into people’s social lives. That makes sense. Thank you for the detail, Benjamin. Like all throwback hippies from the 60’s, Sanders is economically illiterate about the real world of behaviorial incentives and unintended consequences, otherwise he would be economically centrist (or dare I say it, even Libertarian) broading his narrow electoral appeal beyond that of unwordly, naive college students under 25. The oxymoron of centralized state control not wanted over social issues is never deeply examined in not working out over economic issues. Many ex-USSR citizens would have a lot to say about that! Nixon was a RINO and among the very first. But to place Sanders to right of Nixon only makes sense within the relative economic context of today. We’ve progressively shifted to to right economically since Nixon, Deng, 1989, etc. because it works out better for consumers. Sanders wants to shift us to the left and over-burden, if not kill, the fledging economy, EU-style. Given the mess that the EU and Japan are currently experiencing from drastic state over-regulation and intervention of their economies, American voters would have to be really stupid and/or ignorant to willingly choose that path also. Fortunately, Sanders would be blocked by Congress from doing too much economic damage, if any. He’s likely to blow all his political capital just trying to get any one of his progressive schemes implemented to the exclusion of everything else. Sanders wants to model after countries like Norway, which have higher per capita GDP and rank higher on the human development index. Forbes even ranks Norway a better country to do business in than the United States. The USSR has nothing whatsoever to do with Sanders’ policy proposals. I know, but the extremely homogenous Scandinanivan countries are no panacea for a country such as the USA with eleven distinct cultures. Those countries have the highest suicide rates in the world. The cost of living for everything is very expensive due to limited supply and high demand from government overregulation and subsidies. Throw in “island time” speed bureaucracy too. They’re also currently experiencing extreme social friction from lack of assimilation by Muslim immigration. No place is perfect, but the USA has enough current problems (both social and economic) without making them all worse by adding on Politiburo-style non-solutions from Sanders. It’s hard to know what Sanders plans to do exactly because he simply doesn’t have any detailed implementation plans, so one has to assume the worst coming from such an extreme “left winger”. The devil is always in the details. Sanders is white, he’s 72, he lives in a small supermajority white rural state and is not a economic libertarian, yet has plenty of failed “progressive” top-down, state-control initiatives that didn’t work out locally under his belt. Usually the tactic of failed statists is to ply their damage on a bigger, larger, national level if it first fails at the small local. They never, ever admit they are wrong (nor apologize for the damage they caused). None of the claims you make in this comment are true. Scandinavian suicide rates are lower than the US and Norway’s per capita GDP is higher even after you adjust for purchasing power parity. The fact that the US is more culturally diverse is not relevant and has no argumentative force. The current refugee crisis has nothing to do with the economic policies Sanders is interested in implementing. Then you just make slanderous arguments, calling Sanders’ policies “Politburo” when they have nothing to do with the Soviet system, claiming he doesn’t have detailed implementation plans (his policy plans on his website are as detailed as other candidates’ if not moreso), you get his age wrong (he’s 74), you go after him on unrelated ageist and racist grounds (he’s white, he’s old), you call his policies “failed” when they are working in Scandinavia and have worked everywhere in the world they’ve been tried.